Hola! I've been so busy with weddings that I just realized it's been a long time since I blog an engagement session! Today I want to share the excitingly fun day I spent with Tosha and Joy while they were on vacation at my favorite place in the world: Old San Juan. The day started at Starbucks Old San Juan (easily recognizable since there's only one, so I always meet clients there), and quickly I realized how fun and relaxed they were as a couple. We started walking around the old city while snapping photos here and there. Our time together felt more like friends catching up, talking, making jokes and getting to know each other. While we walked Joy told me his funny/unique proposal story: they were living a long-distance relationship, and for Tosha's birthday he drove all the way to his hometown. He started feeling ill and wound up in the ER in need of immediate surgery. Her soon-to-be-fiancée put everything aside to take care of him, all the more reason for him to pop out the question right there in the hospital suite. After a walk around the southern part of the old city, we made a quick pit stop at Hotel El Convento so Tosha could put a different outfit for the last part of the session. One of Tosha's requests was having nature and flowers in her engagement photos. Although Old San Juan doesn't have that many trees and nature, I knew just the perfect spot, and it was blooming with trinitarias (or bougainvilleas), one of my favorite flowers. We had planned on ending it at El Morro during sunset, but on our way back to the parking lot we saw the fountain at Plaza del Tótem, and we knew we had to stop. So here's the gallery, hope you enjoy scrolling through it. I'm sure we did! Straight to the point: Camille is the best!!! 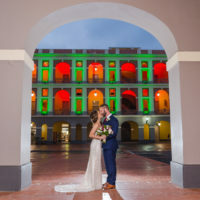 My fiancée and I had our engagement photo shoot in Old San Juan, Puerto Rico. She took us through the best locations of Old San Juan just like we wanted, namely aisles with greens/nature, colorful flowers, vibrant streets and El Morro. We had so much fun the entire time. Camille caught the pure joy we have in our relationship. Needless-to-say, I recommend Camille Fontanez Photography 100%.